Wentworth Park’s Group 3 Evans & Son Jewellers Ladies Bracelet not only saw sensational on track efforts by the women, but also of plenty of off track activities too. Saturday saw both recognition for NSW Women In Racing, as well as a fundraiser for vulnerable members of the community with fundraising for the Beauty Bank. Conducted by the NSW Greyhound Breeders, Owners and Trainers Association the Women In Racing awards were developed to encourage higher levels of female participation across all facets of the industry. NSW GBOTA Operations Manager, Ellen Harris, said that the awards were an important step to opening more doors to the industry. “Despite so many families being involved, many outside of the industry still perceive the sport as a bloke’s domain,” Harris said. The inaugural awards, presented by the Association’s Deputy Chair, Susan Absalom, saw a range of nominations from both the Club and NSW GBOTA Branch sector. “The Association wanted to offer the opportunity to all NSW Clubs but also our Branch networks to nominate worthy recipients and demonstrate why people should get involved in their local Branch,” Absalom said. “I congratulate the nominees; Margaret Bright, Diane Cotroneo, Margaret Enright, Robyn Hayes, Anne Hector, Denise Hill, Vivian Jones, Danielle Matic, Christine McKenzie, Barbara Rees, Raelee Shearer, Lyn White and Donna Widdows, not only on the recognition but also their contributions. “The women nominated reflected not only those which have dedicated years to their Branch and local Clubs, but our next generation of participant,” Absalom added. Claiming the $1,000 winners prizes were Hunter participant Raelee Shearer and Riverina administrator and participant Donna Widdows. Raelee Shearer was put forward by the Newcastle GRC and Gosford Club for her regular and dedicated fundraising efforts for causes such as Breast Cancer research, Children’s Christmas Appeal and assisting participants in need. Having conducted a range of fundraisers for over ten years, Mrs Shearer’s efforts have generated tens of thousands for a range of worthy causes. “I was honoured to receive the award and being recognised for my contributions for giving back to the community over many years,” Mrs Shearer said. For Riverina administrator and participant Donna Widdows the win was a real shock. 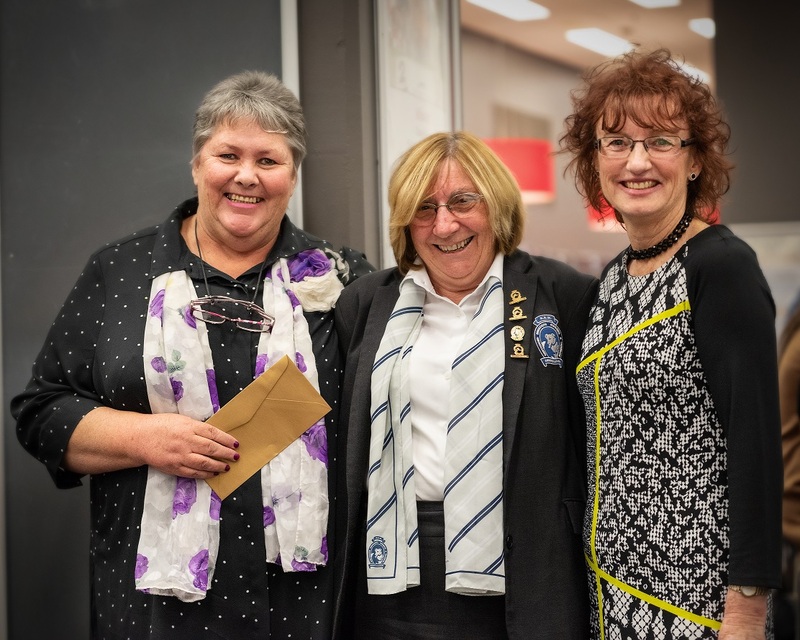 “I was just honoured to have been nominated by our local Temora Branch, but to win was an enormous thrill and surprise, because there were so many women who have given back to their community as well,” Ms Widdows said. In addition to the awards, the NSW GBOTA hosted a cocktail fundraiser on Level 1 which raised in excess of $2,000 in cash and in kind donations. The Association hopes that the night can be built upon, with more clubs and branches nominating worthy recipients and causes in 2019.